Last Friday, Matt Cutts twitted that the 3rd Google Penguin update is under progress, a basic refresh that only affected 0.3 % of English queries. 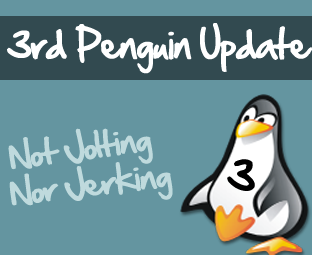 All the predictions were proven wrong as lots of Webmasters and Matt Cutts himself predicted the penguin update to be “Jolting and jerking”. In fact, it was the first time when Google fully pushed out an update on the same day. It means you may have seen key changes from Friday to Saturday. Well, lots of bloggers reported that they have witnessed a foremost dip from Friday to Saturday. Comparing your site traffic from Last Friday to Saturday would allow you to distinguish whether you are safe or hit by Penguin Algorithm. Today we will discuss the Penguin 3.0 Algorithm refreshment from depth. Truly speaking, after waiting more than four and a half month to be exact I was expecting a real gigantic update, but Google seems to be favoring Bloggers for the first time. Well Matt Cutts said that, “We should expect something Jerking and Jolting from the next Penguin update” but that never happened because it affected only 0.3% English queries worldwide. In the past two weeks, the whole webmaster community has witnessed back to back algorithm refreshment once after another. Therefore, we are still unable to understand which refreshment causes an impact. Here, is the brief history what has happened. EMD UPDATE: on September 28th a first ever algorithm refreshment was rolled out that mainly concerns with the “Exact Matched Domains”. Panda Algorithm Update: on September 27th through October 6th which affected less than 2.4% of English queries worldwide. Penguin Refresh: on 5th October, it affected only 0.3 English queries (Current One). Since, these refreshments were rolled out in 2 weeks so everyone is failing to understand which update has affected their SERP Ranking. After doing a research work, we have come up with a graph that shows what actually happened during the refreshments. The above graph shows that, whenever an Algorithm updates arrives the traffic goes down so which proves that all the updates have the similar sort of impact on search engine results. However, it is not exactly accurate. Things are getting too hot because Google is going blizzard with its back to back algorithm refreshments. Almost each and every blogger is worried about the rapid changes in Google searching algorithms. These two weeks were extremely eventful it consists of lots of ups and downs. According to our estimates, Google would be preparing for the next refreshment so it’s essential that we concentrate on building quality content. Hope you have enjoyed the roller-coaster ride till then Peace, Blessings and happy blogging.
" Pappu yaar Tang na ker "
HAHA, Its just a Minor Update. Next Penguin Update is at 29 October and it would be a Jerking and Jolting One.. Speak english brother, would you please help me? Don't ask me why and what for, just help me out.. I need the address/url of the blogger's download/restore template tab. Exactly/more specific, every address after you click "template".. Please brother, i need those url. Nyc information syed..keep posting bro !! :) We are unable to understand what you mean! Well, give me the url of the page where you'd download your template. And the url of the page where you'd edit your template code..
Well, you're kidding me when i'm serious. Great..
Okey, clear. You're kidding, or don't want to help me. Is it realy so hard to give a link? I wonder..